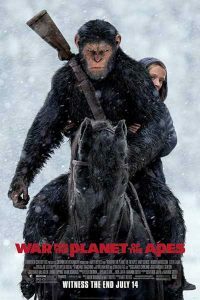 War for the Planet of the Apes is the final installment of the excellent trilogy which includes Dawn of the Planet of the Apes (2011) and Rise of the Planet of the Apes (2014). The final segment takes off from the ending of Dawn which saw Caesar, the leader of the apes, defeating Koba, his friend who turned against him. Caesar carries a tremendous wound of sadness over the betrayal, and subsequent death, of Koba. Caesar wants to live in peace, but the remaining humans continue to attack the apes, who live in the redwood forests of Northern California. The battle becomes personal when the leader of the humans, known only as “the Colonel” (Woody Harrelson), kills Caesar’s wife and son. After this, Caesar, accompanied by a few of his closest friends, attempts to track down the Colonel to get his revenge. Along the way, the group finds a mute human girl, whom they name Nova, whose parents have been killed. Not wanting to leave her alone, they bring her along with them. In addition, they encounter another ape, who was given the name “Bad Ape” when he escaped from a zoo in Reno. Like Caesar, Bad Ape has been taught to talk. He joins them and acts as the comic relief in an otherwise serious movie. Caesar and company are eventually captured by the forces of the Colonel. They are held in captivity in a prison camp near the California/Nevada border along with a large number of apes: male, female, and their young, including Caesar’s younger son. The apes are forced to do heavy labor, without receiving food and water. The apes learn that the Colonel’s forces are anticipating an attack by another group of humans, for gain control of the region. The movie contains a surprising amount of religious symbolism. Caesar and other leaders of the apes are crucified by the humans on St. Andrew’s crosses (the X cross). The Colonel also keeps a cross prominently displayed in his quarters. While crucified, Caesar is taunted by the soldiers with water. Rather than give him a drink they throw the bucket of water on him. So, the wise, compassionate, peace-seeking Caesar becomes a Christ figure! War for the Planet of the Apes also includes many references to other movies, most notably Apocalypse Now. The Colonel seems modeled after the mad officer Kurtz. In a tunnel, the apes notice graffiti on the wall saying “Ape-Pocalypse Now.” The climax even features an attack of helicopters, resembling that of the classic movie. There are nods to other movies as well, from the uprising of the slaves in Spartacus to prisoners tunneling underground in The Great Escape. Once again, Andy Serkas is excellent as the computer generated Caesar. We feel his pain as he sees his fellow apes suffer at the hands of the humans, and his dilemma when he has a chance to kill the Colonel. I would love to see Serkas, with his expressive eyes, receive an Oscar nomination for his performance! Writer/director Matt Reeves does a great job moving this story to its conclusion. It has its epic moments, but also its intimate moments. When Nova risks her life to bring some food and water to Caesar and offer him her doll for comfort, it’s an incredibly touching moment. At 2 hours and 20 minutes, Travers paces the movie well, so that it doesn’t seem to drag as many other longer movies do. Technically, the movie is a marvel, as were its predecessors. The special effects are exceptional. Worth particular note is the rich musical score by Michael Giacchino. In a movie with little spoken dialogue, the music is tremendously helpful in shaping the emotions. The only drawback I noticed in the technical department is that, especially in the first part, the movie is very dark. I understand that is part of the tone, but, at the same time, it seems so dark that it’s hard to see what’s happening. This may have been the fault of the projection in the theater in which I saw the movie, and the fact that I didn’t see it in IMAX or 3-D. Overall, War for the Planet of the Apes is an exciting and intelligent adventure movie, but it’s more than that. It’s certainly an odd feeling to root for the apes against the humans. But, ironically, it’s the apes who seem more human, peace-loving and compassionate. Caesar is a great character, who struggles with his own emotions, while attempting to maintain peace and the common good. I like having a summer blockbuster with depth to it! As this Planet of the Apes trilogy comes to a close, I will certainly miss Caesar and his friends. I look forward to going back and binge-watch all three of these movies. The movie is rated PG-13. As expected, there is some violence, but I didn’t find it excessive.